There are 116 condo towers under construction in Toronto according to Global News via Emporis - a construction industry research firm in Germany. As a senior analyst from Emporis put it - the number of new projects across Canadian cities — and in particular, Toronto — easily outpace those seen in markets from Moscow to Los Angeles. Even compared to New York (32) there are over three times more condos rising in Ontario's capital. Older data published by Toronto's City Hall (via Emporis) shows that on January 6th, 2014 there were 111 high rise buildings under construction. That's down 40% from a year ago when there were 184 cranes crowding the city skyline. Hmm, maybe that's why the unemployment rate shot up to over 10% this past December. Now let's take a look at the total number of apartments under construction in the GTA. Keep in mind that the most recent data is from November 2013 - hence a disconnect between the number of condo towers under construction versus the number of units in the pipeline. The chart below shows the number of apartments under construction adjusted for population. 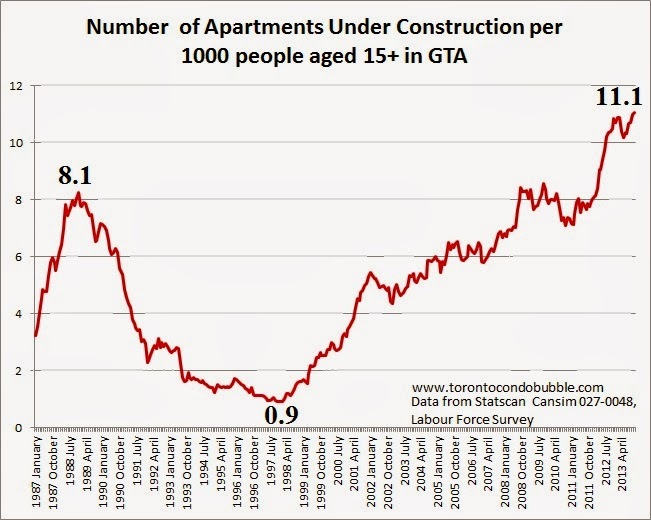 We currently have 11.1 condo units produced per 1000 GTA residents aged 15+. That's over ten times more than in 1997 and 39% more than during the late '80s bubble. 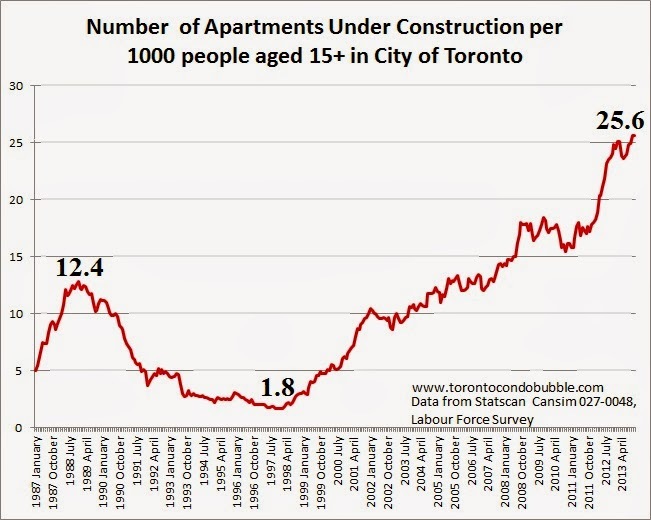 Critics may point to the fact that there was a fundamental shift in demand away from low rise homes to high rise ones in Toronto - hence some of the increase in condo construction is justified. Agreed. Now I don't have a way to quantify how much of the demand is based on this fundamental shift yet I am going to suggest that this shift alone is not responsible for the current condo boom. 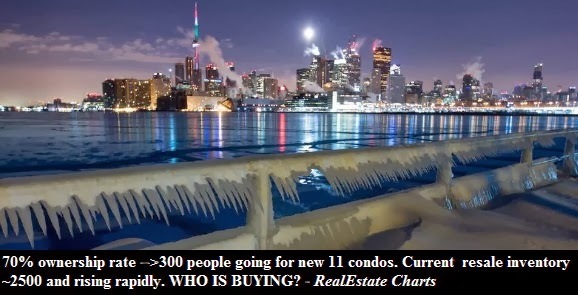 Consequently, I believe that much of the condo exuberance in Toronto is due to over-investment in the sector which resulted in the condo bubble. Also consider that ~90% of condo towers under construction are in the City of Toronto which experienced a fraction of population growth compared to suburbia (905). Below is the same graph as above but for the City of Toronto. Note suburbia definitely has an effect on Toronto's condo market so there might be a slight error (+/- 10%) in the exact numbers. Nevertheless I believe the trend is accurate. 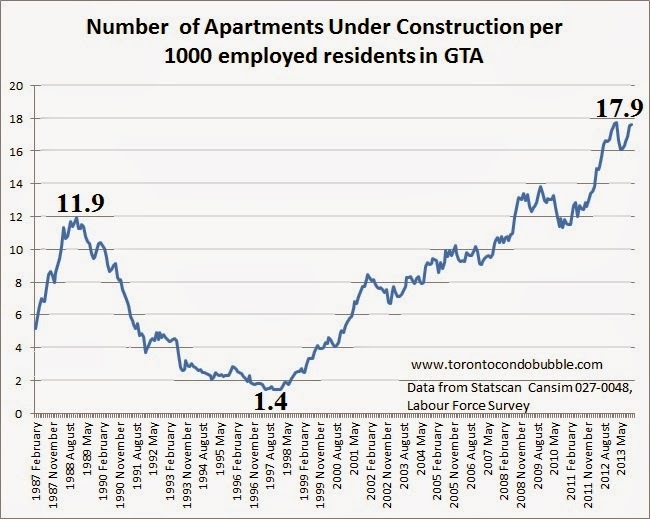 Finally I adjusted the number of condos under construction in the GTA for the number of employed residents. Are we building too many condos in Toronto? I think we do! Moreover when the current condo boom ends it may result in early '90s all over again! You can download all the data used in the above calculations here and here.